Zondag 21 mei vindt er in Arti een bijzondere finissage plaats van de tentoonstelling ‘My future is in my past and my past is my present’. Vanaf 16.00 uur zal theatergroep SPACE onder leiding van Petra Ardai een openbare repetitie houden van de voorstelling SOS EARTH – 99% weerbaar. Live muziek van Claudio Ritfeld (bekend van zijn band De nachtdienst) en van de Syrische percussionist Modar Salama vormt de playlist voor dit enkeltje naar Mars. Terrestrial refugee stories seen from Mars. What if the places where you always thought you were safe would soon cease to excist? How would you prepare to leave your mother planet? How would you say goodbye? What would you take with you? Can you feel at home elsewhere? SOS Earth – 99% resilient is an interactive music theatre documentary. The performance takes a closer look at current fears around populism, identity and migration with a suprising ‘what if’ scenario. After the Earth becomes uninhabitable all humans become migrants. 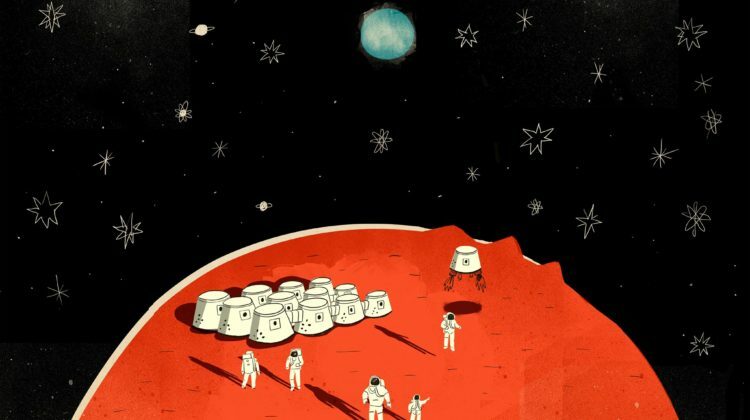 SPACE and the public take on the task of forming the first model colony on Mars. How can we prevent Mars from becoming just as uninhabitable as Eart has become? In a series practical resilience exercises led by experienced experts, we are offered a ‘reality check’. SOS Earth – 99% resilient is an intergalactic survival course. The emptiness of the red planet throws us back on what binds us as without each other we won’t make it. At first we are defenseless but at the same time we have plenty of possibilities. Every path is open. The playlist for the one-way ticket to Mars includes live music by Claudio Ritfeld (known for his band De nachtdienst) and the Syrian percussionist Modar Salama.